With Saint Patrick’s Day approaching there are other ways to decorate your home in green and show off your Irish pride. Then restricting yourself to the mischievous little men dressed in green with their pots of gold. Known as Leprechaun’s. I know we all have dreamed of finding that pot of gold one time or another. But let’s face it we would have better Luck winning the lottery, so let’s get that out of our heads, my head right now and get back to the Saint Patrick’s Day décor at hand. 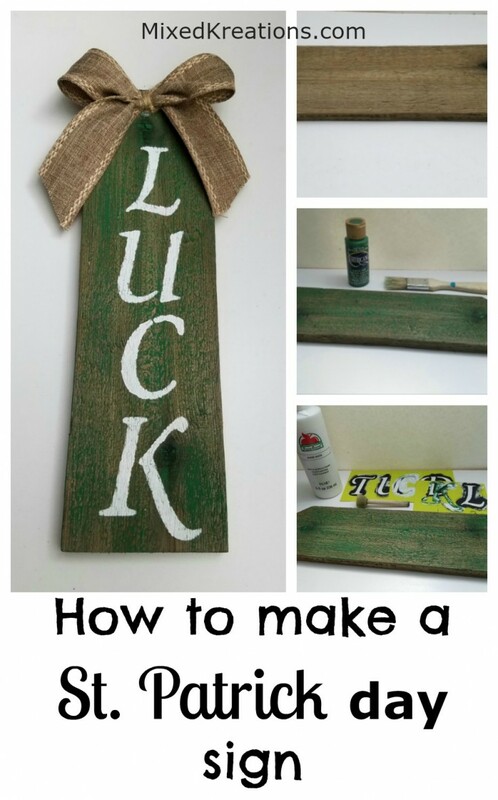 So, with the mischievous little Leprechaun’s out of the way let’s get started with today’s project, the easy Saint Patrick Day Luck Sign. Easy enough for any new crafter. Let’s start off with one of my favorite crafting materials, the cedar fence picket. Unless you are one of the lucky ones that can get your crafty little hands onto some reclaimed wood, or even pallet wood. With me No Luck so I have grown fond of the cedar pickets. They are cheap, and you can use some of my secret aging potion, Not so secret to make the wooden pickets look aged. 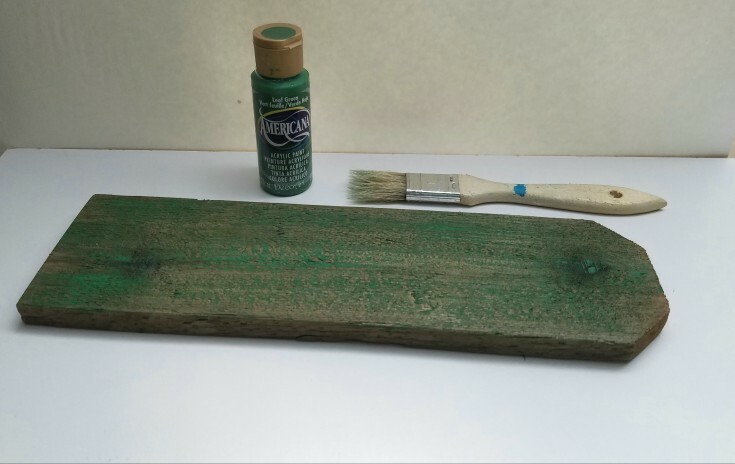 Next dry brush some green acrylic paint onto the picket, leaving some of the aged wood showing through. Old paint brushes are great for this. 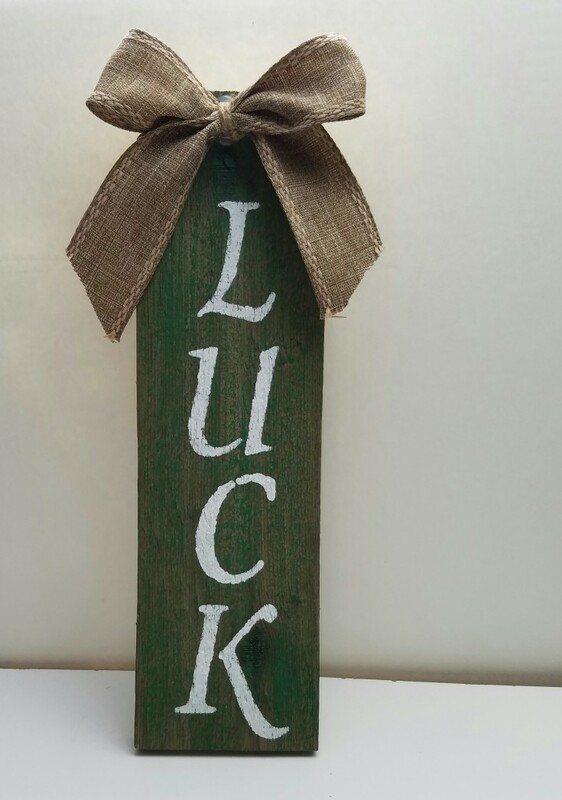 Now it’s time to add the word Luck to our green picket. 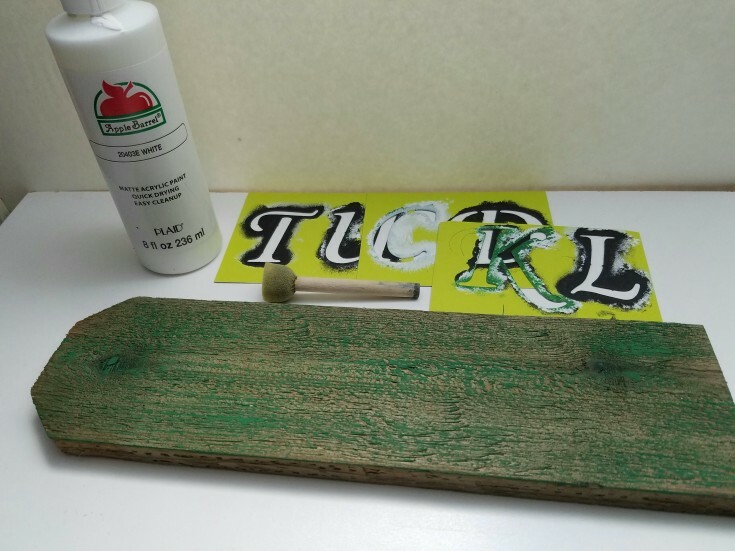 Pick out a letter stencil that fits your picket and the font that you want, or you could paint it free handed. I use to do all my signs free handed because I wasn’t very good at stenciling. But once you figure out a little paint goes a long way with stencils, less is best. If you add to much paint it bleeds under the stencil and then you have fuzzy lines. But then if you been nipping at the Irish whiskey then you are going to see fuzzy lines no matter what. So just remember just dab on a little paint at a time. I think that my Saint Patrick Day Luck Sign needs a bit of something else. What do you think? There’s not enough room for a shamrock so how about a burlap bow? Burlap makes everything better, don’t you agree? Doesn’t that look better by just adding a simple burlap bow? 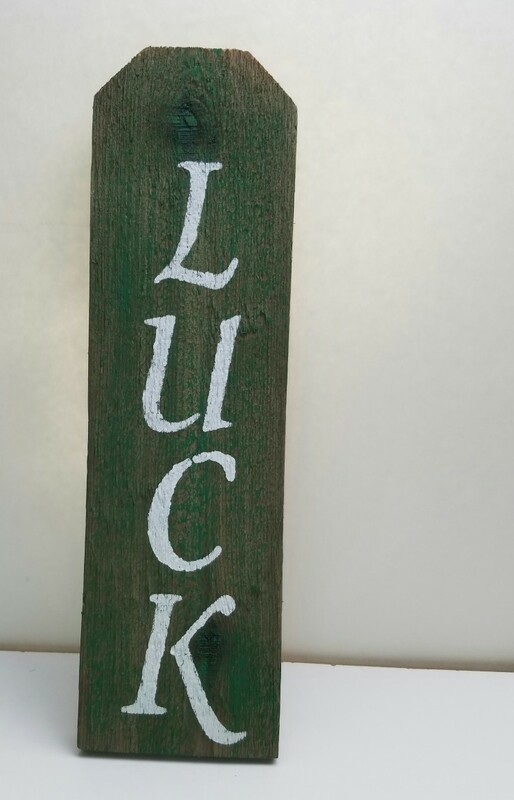 Now it’s time to show off your easy peasy Saint Patrick Day Luck Sign. 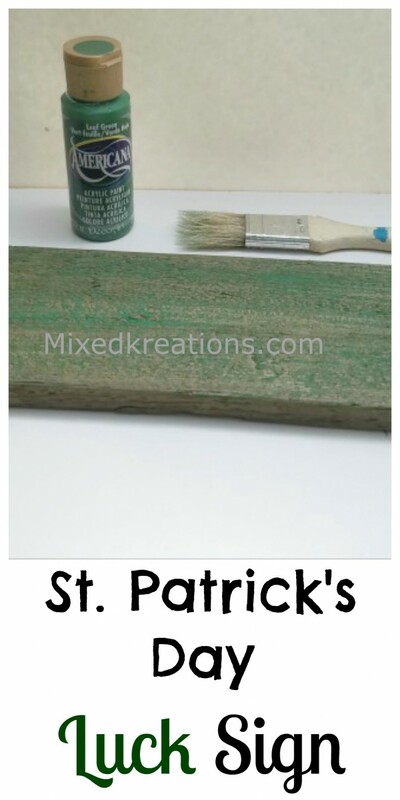 Sit it on a shelf, or even the mantle, and mix in other Saint Patrick’s day deco and you are good to go. You can still decorate with green, but no need to have those mischievous little Leprechaun’s, especially since they won’t share their pots of gold. What have you been working on for Saint Patrick’s Day? Other Post You May Enjoy! Ha! Linda I have to agree burlap bows make everything so much better. That is a lovely sign and I know the Leprechans would be jealous but since they won’t share you don’t have to either. Yes those mischievous little Leprechauns are stingy with their pots of gold, but maybe if we gave them some whiskey they would share, lol. 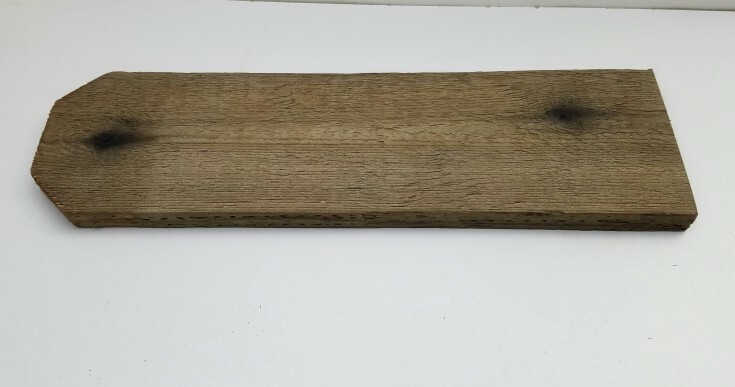 I love love the aging solution, it’s a inexpensive way to age wood easily. Can’t get better then that. Thank you Michelle! Years ago when I did any stenciling they always bled under, but I finally learned just a little paint goes a long ways. And you got to take your time, when I get in a hurry it bleeds under. 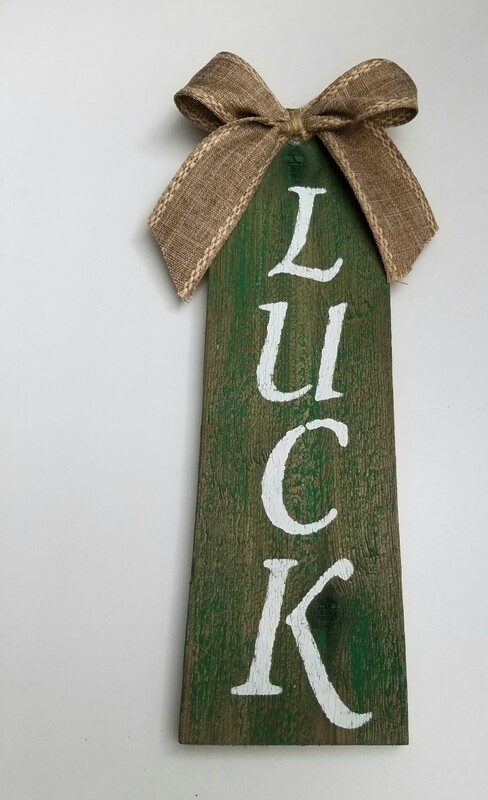 The burlap bow really brings together this Luck sign. Wish I could have seen where you put it in your home. Happy Belated Easter. Thank you! This sign went to my craft booth. Happy Belated Easter to you as well!